Before you decide to do-it-yourself or hire the least expensive painter you can find, here are some points to consider that suggest the lowest price may not be the best value. Why hire Metcalf Painting and Flooring? Safety – Painting can be hazardous work. Hire a professional contractor that is fully insured. Metcalf Painting and Interiors carries workers compensation and general liability – $1,000,000 aggregate. Experience – Metcalf Painting and Interiors has been in business for over 30 years with over 15,000 satisfied clients. Preparation – Getting the surface properly prepared makes all the difference. We know the value of preparation and will do it right. The choices of paint today are much more complicated than just oil and latex. Metcalf Painting and Interiors knows what products work best for each individual application. Supervision – All of our jobs are fully supervised. We treat your property with care and respect. Final Inspection & Payment – We do a final inspection with the homeowner and do not request payment until the job has been completed to the your satisfaction. We accept cash, checks and credit cards (Visa, MasterCard, Discover and American Express) Credit card payments incur a 3% processing fee. Guarantee – We offer a 2-year guarantee on all workmanship, as well as product warranties from only the best brands in the industry. Metcalf Painting and Flooring has been transforming houses and businesses in, Cary, Morrisville, Apex, Holly Springs, Raleigh, Garner, Wake Forest, Fuquay Varina, NC. since 1986. Craig Metcalf, born in Raleigh and raised in Apex is one of the few “natives” to the Triangle. Craig founded Metcalf Painting & Flooring in 1986. With over 30 years experience in the painting industry, Craig’s refined knowledge and exceptional leadership are critical components of running a successful business. He is highly recognized in the community for his outstanding service and professionalism. Craig most enjoys providing genuine customer service for custom-oriented people. Merri Lea Metcalf, co-owner of Metcalf Painting & Flooring, is the Office Manager. The list of her responsibilities is long and varied. She handles customer service, accounts payable, accounts receivable, scheduling, marketing – just to name a few. Originally from the Mid-West, she has called Cary, NC home for over 25 years. Craig & Merri Lea’s 5 children and 3 grandchildren were all raised in Cary and fortunately all still live close by. Before joining her husband Craig in the business, Merri Lea was an executive assistant in the corporate world for many years. Merri Lea enjoys interacting daily with new customers and repeat customers who continue to come back to us for all of their painting and flooring needs. Carmen Metcalf has been the Flooring Division Director since 2014. As the newest addition to the team, she brings great enthusiasm and attention to detail to every flooring project. Carmen enjoys meeting with home and business owners to learn their personal style so she can recommend products that will fit their vision and functionality. Her passion is to make every client’s house a home. 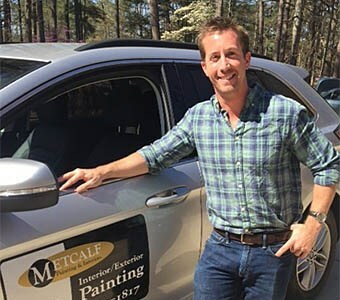 Mike has been representing Metcalf Painting & Flooring since 2007. With a B.A. in Business Administration, he brings a unique and diverse background to our team including: 20 years experience in restaurant/brewery operations, six years experience in the transportation industry operations and sales management, and seven years in residential and marine painting. As a member of our team, Mike thoroughly enjoys meeting and getting to know new people every day! Steven has been representing Metcalf Painting & Flooring since 2011. He received his B.S. in Microbiology with a Minor in Biotechnology from NC State University. Being a part of our team allows Steven the opportunity of meeting and working with new people every day and helping them improve their property in ways that work best for them and their needs. Eric has been representing Metcalf Painting & Flooring since 2011. He received his B.S. in Sports Management from NC State University. Eric enjoys being a part of our team as it allows him to serve the community by beautifying and protecting the homes and businesses of its residents. He loves building relationships with customers, learning their needs, educating them on how Metcalf can help, and delivering an outstanding experience. Interior and Exterior Painting Services. Great customer experience and drive employee productivity. New hardwood, laminate or carpet. Sign up with your email address to receive exclusive offers.